The New Cold War, despite being very different from its predecessor in many ways, is replicating it when it comes to the impending resumption of the Space Race. The world is in the midst of a New Cold War between the unipolar and multipolar forces, or as one can argue, between the American-led and Chinese-led direction of multipolarity. The US’ post-(Old) Cold War unipolar hegemony over global affairs during the 1990s has progressively given way to the emergence of a handful of influential Great Powers that are exerting ever more influence over the course of International Relations, thus leading to the overall system’s diversification away from its previous American centrality. The US is using a variety of proactive kinetic (e.g. military, “insurgent”) and non-kinetic (e.g. sanctions, infowar) means to retain its predominant hold over the world, with the resultant friction that it’s creating with its Russian, Chinese, and Iranian challengers manifesting itself in the most dramatic way in the Ukrainian, South China Sea, and Syrian battlefields of the New Cold War. Some observers are of the opinion that the US will never regain the near-total control over international affairs that it had immediately after the dissolution of the USSR, instead settling to be the “first among equals” in what increasingly seems to be the irreversibly multipolar system of the future. To that end, the US is relying on a combination of Kissingerian Great Power “balancing” through its “Lead From Behind” strategy of co-opting stakeholders to participate in campaigns of shared interest (e.g. convincing India to cooperate with America in “containing” China) and the Brzezinskite “weaponization of chaos theory” to provoke Hybrid Wars in pivotally important transit states along China’s New Silk Road. Whether one believes that unipolarity can still be saved or that the US is trying to shape the emerging Multipolar World Order, the aforementioned situational description roughly describes the general contours of contemporary International Relations. For as dynamic as events may be on earth, the real game-changer in the New Cold War will be all about what happens in space. Russia’s recently unveiled hypersonic missile technology neutralized decades’ worth of the US’ anti-missile investments and restored the nuclear strategic parity that America was dangerously trying to undermine in order to blackmail its nuclear-armed rivals in Moscow and Beijing. Caught flat-footed and unable to conceive of how its current technological investments in the field could be modified to adapt to this new development, the US realized that the only way for it to regain what it originally believed could be its edge over everyone else was to take the New Cold War into space through the creation of a so-called “Space Force”. Previously discussed in the media over the past year and obviously deliberated on in private among the members of the US’ permanent military bureaucracy for decades, one of the many purposes of this newly proposed branch of the armed forces is to respond to Russia’s hypersonic missiles. There’s literally no technology on earth that could detect these missiles in time to respond to them, let alone intercept them, which is why the US has been publicly flirting with the creation of a planetary space-based sensor network that would realistically be the most visible element of the Space Force. 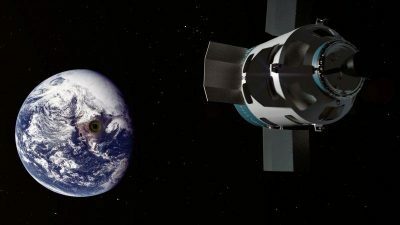 Because of its presumably “defensive” (or at the very least, “non-offensive”) role, the US would portray its unprecedented official military foray into space as “reinforcing peace” instead of disrupting it, even though its true purpose would be to detect hypersonic missile launches and then feed the information into possibly automated space-based attack vehicles such as the secretive X-37B that would be part of its “Prompt Global Strike” strategy for immediately responding to such scenarios. In layman’s terms, the public face of this program would be “defensive”/sensory while the clandestine one would be offensive/”retaliatory”. If the US acquires the capability to respond to Russia’s hypersonic missile advancements, then the aforesaid “superweapon” would no longer have the peacemaking strategic edge that it once did. It would still theoretically be capable of restoring the pre-2001 strategic balance with the US prior to America’s unilateral development of its so-called “missile defense shield”, which is in and of itself a tremendous achievement because it would keep the US’ conventional military forces in check, but only so long as the Pentagon doesn’t move its anti-missile infrastructure to space and enhance it to the point of being able to shoot down Russia’s hypersonic missiles. Should that happen, then the same dangerous state of affairs that Russia originally sought to rectify through this technology would return, with the main difference being that the US would now be relying on assets in outer space to assist in its campaign to neutralize its rivals’ nuclear second-strike capability and thus make them susceptible to nuclear blackmail. Nevertheless, Russia could still devise solutions for combatting this. The most realistic options presently at its disposal are to continue investing in its hypersonic missile technology in parallel with building up the submarine component of its nuclear triad. Looking forward, however, Russia will eventually need to unveil anti-satellite weapons such as lasers, missiles, and kamikaze satellites that can take out the US’ space-based sensors in the event of war and blind its retaliatory systems such as the X-37B. Of course, it should be assumed that the US is preparing for these eventualities and is also deviously planning to pretend that Russia already has this technology in order to “justify” its proactive deployment of these same weapons on the false pretense that it’s doing so “defensively” and in “response” to so-called “Russian aggression” even though Moscow once again promised not to be the first one to field this technology in that domain. At the end of the day, the outcome of the New Cold War might not be decided by geostrategic or economic factors, but by whichever side wins the military ones related to the New Space Race.